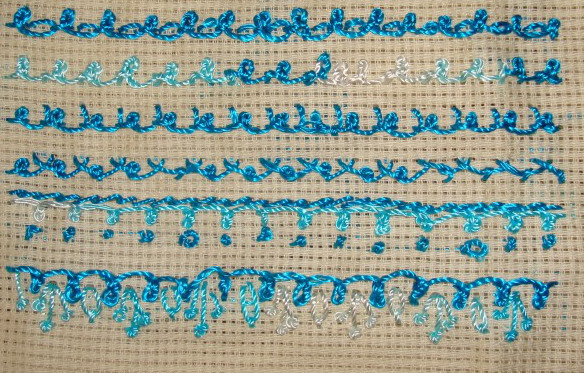 Stitch combinations are worked in the last part of this sampler. 6. Wrapped coral stitches were worked with chain stitches in the first row, and coral stitches in the second row. 7. Buttonhole stitches and herringbone are worked with wrapped coral stitches in these rows. The knots look quite decorative. 8. 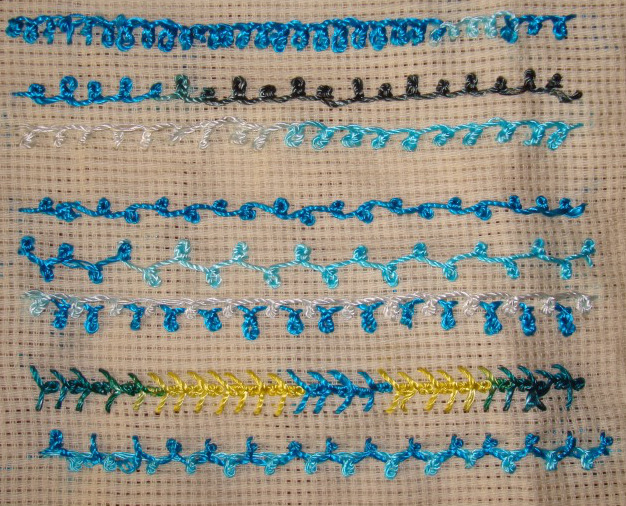 The other stitches are worked separately in these samples. 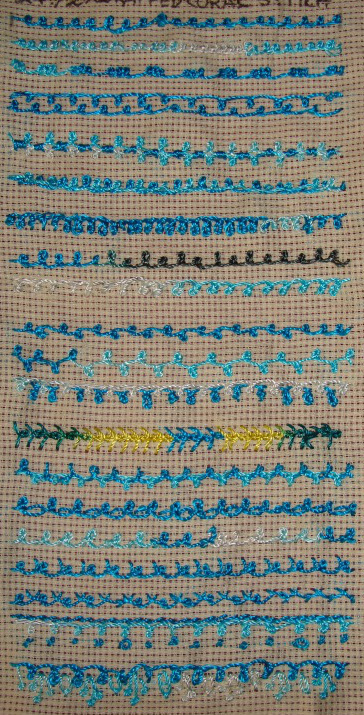 Stem stitch and french knots are worked in the first row. Detached chain and pistil stitches are worked in the last row. With these variations the sampler is completed. I am happy to learn this stitch and enjoyed working on this stitch sampler. Few more samples of this stitch that were worked today. 3. I tried taking longer stitches to work wrapped coral stitches in the first row. 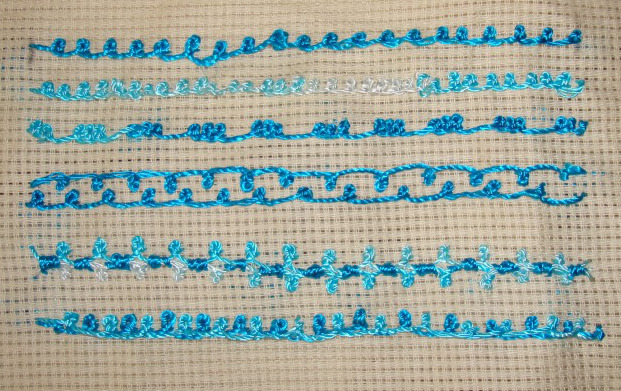 Long and short wrapped coral stitches are worked alternatively in the second row. The stitches are worked at angle in the third row. 4.in the first row, the stitches are worked on both sides. Though this involved turning the frame often, it was worth it. The idea is repeated in the second row in zigzag manner. Individual wrapped coral stitches are worked in the spaces in the last row. 5. individual wrapped coral are worked one after another in a line in the first row. I whipped a row of wrapped coral with wrapped coral stitch in the second row. I liked coral stitch, it was easy to work. The wrapped coral stitch is 72nd week’s stitch on the TAST 2013 challenge by SharonB. The workings are detailed on her blog. I started with this stitch sampler today. 1.The first row is the trial row, the coral stitches are worked slightly apart, when worked like this, the wrapping creates a scallop, which is interesting. The stitches are worked closer in the second row. Coral stitches are worked closer and apart to form a pattern in the third row. 2.Two rows of wrapped coral stitches are worked together in these samples. The scallops are also wrapped just as for fancy hem stitch [ I am yet to work on it, in this challenge!]. The rows are worked one over the other in the third row.